Wix is adding CRM capabilities to its platform with the official launch of MyAccount. Wix’s MyAccount CRM solution consolidates business functions like contact management, email marketing and automated communications into the Wix platform. This helps solve a growing need for small businesses (SMBs) that are looking to streamline business activities via a single, easy-to-use dashboard. 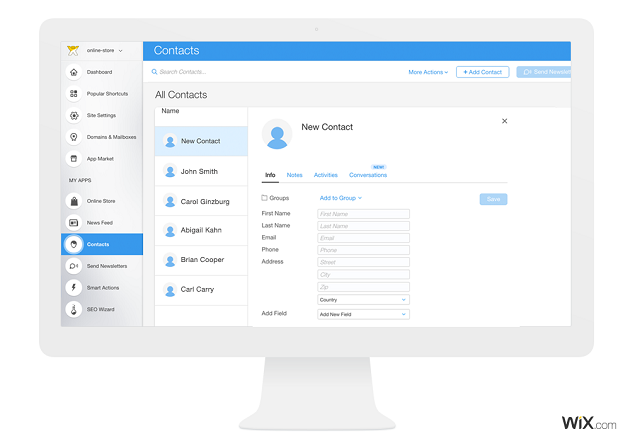 Through the CRM solution, SMBs can collect and manage customer contact lists with information and activity data sourced through the owner’s site. Plus, Wix’s data sharing API, WixHive, further enables users to capture a variety of actions taken by website visitors, including contact information, messages, purchases, bookings and more. The visitor data for each site is stored and managed in a centralized database dedicated to that site and can be accessed by installed apps, which enables business owners to manage customer relationships and take other actions based on data. In addition, SMBs can leverage the solution to create and distribute email marketing campaigns and announcements to specified contacts or groups, as well as create and manage rule-based communications triggered by visitor activities. Users can also access and manage Wix’s vertical-specific solutions like WixStores, WixHotels and WixMusic through the MyAccount dashboard. Moreover, the solution provides real-time updates of visitor activities and enables users to manage website and account settings. “MyAccount is the central nervous system, coordinating numerous essential business elements in a single, unified setting. We’ve created an ecosystem where small business owners can seamlessly integrate their Web creation with robust business applications and functionalities that help them manage and grow online,” said Avishai Abrahami, Wix Co-Founder and CEO.